Right when we’re heading out the door, there’s always two things we seem to magically lose in the morning. Our phone and keys are just small enough that they can get wedged into the couch, fall into a bag, or slide underneath a piece of furniture fairly easily. Locating them is pretty difficult if you don’t have any devices attached to them that will notify you of their whereabouts. The GOkey can take care of all our daily annoyances in a snap. This is a charger, key locator, 8-32GB of memory, and has a USB cable for syncing your phone. It attaches onto your keyring, so when you lose your keys, you can look on the corresponding app on your phone and it will chirp when you are near. 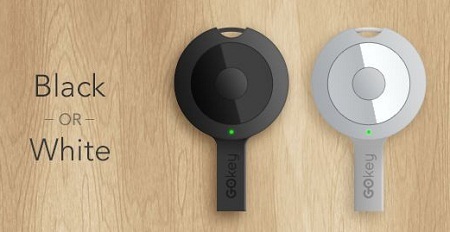 Should you lose your phone, the GOkey can call your phone with the push of a button. That will work swimmingly so long as you remember to keep your sound on. This can charge your phone, but will only provide about 2 hours of power. That should be enough time to get you to another charging station. To see how much battery the GOkey has left, just shake it and you’ll get a green light if it has a lot of juice left, and a red if it’s running on fumes. If you often find yourself scrounging for your keys or phone in the morning, then you’ll be looking at anywhere from $49-69 depending on how much memory you want.